Pounds, shillings and pence were replaced by dollars and cents − 27 million new banknotes and 165 million new coins. The new money was valued at $120 million and weighed more than 700 tonnes. The banks were closed from Wednesday 5 July to give staff time to convert their records. Decimalisation had been discussed since the 1900s, and by the 1960s both the National and Labour parties favoured the change. The National government announced its decision in 1963; decimalisation would be overseen by Rob Muldoon, the under-secretary of finance from 1964 (and a future prime minister). The date for its implementation would be 10 July 1967. There was much public discussion about what to call the new currency. Names suggested included ‘crown’, ‘fern’, ‘tūi’, ‘Kiwi’ and ‘zeal’. In the end, New Zealand followed Australia and settled on ‘dollar’. The new coins were in denominations of 1, 2, 5, 10, 20 and 50 cents. The initial designs for the coins were criticised by the Royal Mint, and designs leaked to the public in early 1966 also got the thumbs-down. The government then published a selection of the designs submitted and asked for public input via voting forms published in newspapers. Designs by New Zealander James Berry were ultimately chosen for all six coins. 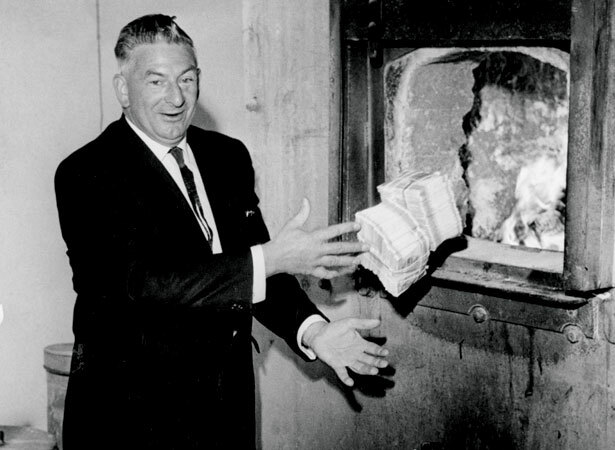 The notes – the first New Zealand paper money to show the reigning monarch – were kept under wraps until June 1967 to thwart counterfeiters. In the weeks before 10 July, $112 million worth of the new notes and $8 million in coins was delivered to trading banks around the country by secret trains carrying Reserve Bank, police and army personnel. The new $1, $2, $5, $10, $20 and $100 banknotes each had different native birds and plants on the reverse, and were distinguishable by colour. Their design featured complicated geometric patterns, including Māori iconography. A $50 note was introduced in 1981, and in 1990 the $1 and $2 notes were replaced by coins. We have 4 biographies, 7 articles, related to New Zealand adopts decimal currency.